The annual Chabad on Campus International Shabbaton—now called Pegisha: International Student Conference—takes place from Nov. 3 to Nov. 5, when more than 1,200 university students will converge on New York to learn, pray, socialize, tour and spend a traditional Shabbat in the Crown Heights neighborhood of Brooklyn, N.Y.
Add to that Chabad-Lubavitch emissaries who have joined existing centers, growing their presence and Jewish offerings to students across the globe, in addition to campus Chabads buying, renovating or building new facilities with amenities for use by students, faculty, community members and visitors. Rabbi Meir and Shaina Rapoport, co-directors of Chabad at Stockton University in Galloway, N.J. It was a whirlwind of sorts. 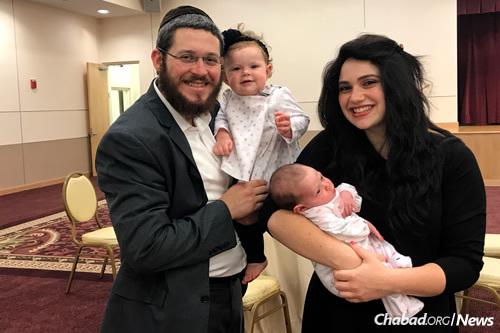 Rabbi Meir and Shaina Rapoport started a Chabad House at Stockton University in Galloway Township, N.J., this time last year, living off-campus to serve the 900 or so Jewish students there. Within a few months, they already had their minds on something bigger and closer to the main college center. For the Rapoports, their 7,500-square-foot student center has become a larger community center as well. An hour after the sign went in front of the opened building, reports the rabbi, a Jewish woman from Texas who was new to the area saw it and called to get involved. 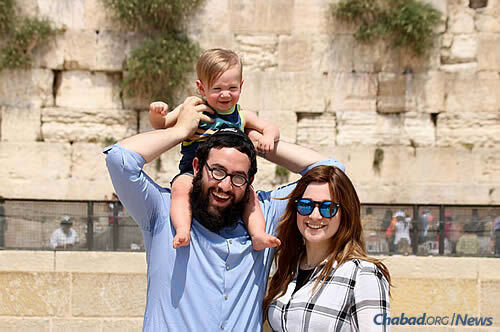 Week in and week out, they get more and more responses from community members looking for a Jewish place to eat, pray and learn; the Chabad couple has added some 200 to 300 area Jewish families to their guest lists. It has been less than a year since Rabbi Shmuel and Nechama Slonim founded a center to serve the Jewish needs of students at Rice University, Baylor College of Medicine, the University of Texas Medical School, South Texas College of Law and the University of Houston. Then came Hurricane Harvey. The couple rallied students and immediately led the charge, bringing volunteers to hard-hit homes around the Houston area. Gordon notes that their work was reflected all across Texas, Florida and the Caribbean, which were pummeled by hurricanes Harvey, Irma and Maria. Led by campus Chabad rabbis, students came out in droves to help clean up after the storms, often traveling miles to pitch in. Goods are still being collected on their behalf, and schools have initiated fundraisers for these areas. In California, too, local campus Chabad centers have been organizing groups of students to assist families dealing with the aftershocks of wildfires that ripped through the northern part of the state, as well as those outside of Anaheim in the south. “For the first two days, many students were sitting around and feeling bad,” says Leah Sherman, a native of Memphis, Tenn., who is majoring in bioengineering at Rice. “When Rabbi Shmuli Slonim from Chabad asked us to get involved, we were very happy to have a way to contribute,” she says. Rabbi Eliezer and Mushky Gurary are creating a community for Jewish students in the city of Orange, 15 minutes from Anaheim and home to Chapman University. The Gurarys moved out in February to serve four universities, including Chapman; California State University, Fullerton; Fullerton College and Rancho Santiago Community College District. 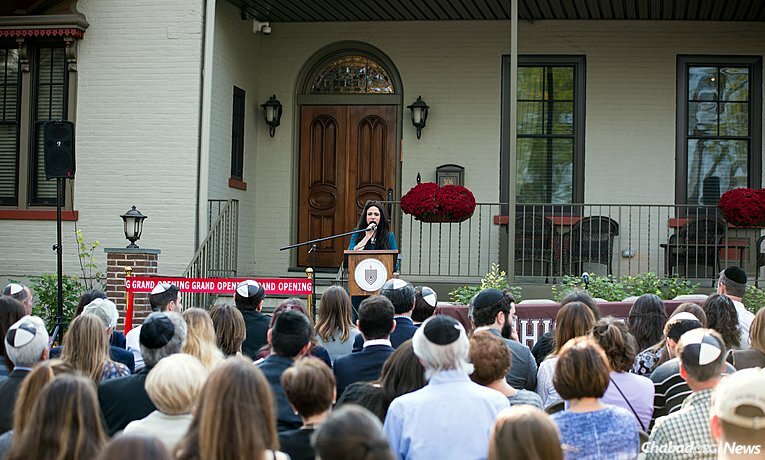 With a total enrollment of 8,000 students at Chapman, and of them, an estimated 700 to 800 Jewish ones—added to another 2,000 Jewish students among the other schools—the Gurarys have been busy meeting and getting to know a whole roster of people. The couple rented a house through July and recently closed on a two-story home with a sizable backyard. Their campus activities include a mezuzah bank that lends out mezuzahs to affix to the doorposts of student rooms and a chicken-soup express service, where students who are under the weather or in need of comfort food can get homemade hot soup delivered right to their doors, courtesy of the Chabad emissaries. Rabbi Yigal and Elana Rosenberg, co-directors of Chabad of Santa Clara, Calif.
A few hours’ drive away in Santa Clara, Calif., Rabbi Yigal and Elana Rosenberg welcome undergraduates, graduate students and young professionals into their home and adjoining community garden, a 10-minute walk from campus. Since they arrived in the Northern California city a year ago, the Rosenbergs have hosted more than 60 Shabbat meals for students—many of them with themes, such as an Israeli Shabbat, a “Cinco de Mayo” Shabbat, a “Shabbat in America” for the Fourth of July. The rabbi, also a city chaplain on the Santa Clara police force, is easy to spot, as he frequently travels by skateboard. “Students see me riding around campus, and it breaks down a lot of stereotypes and barriers from the beginning,” he says. 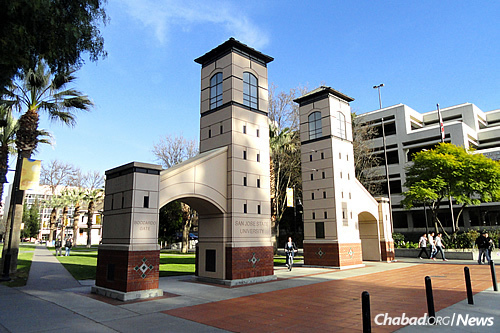 Some 250 students out of Santa Clara University’s total of 5,000 enrollees are estimated to be Jewish. The Rosenbergs also look for ways to reach out to Jewish career professionals who work in nearby Silicon Valley. Initiatives include “Jewwork,” a shared workspace at Chabad, complete with a kosher lunch, and “Pitch Night,” where local startup companies, many of them tech innovators, can spout out creative ideas to a panel of judges for feedback and incentives. “As opposed to a typical ‘Pitch Night,’ here you actually have fellow Jewish community members who will follow up with you and who you’ll bump into on a regular basis, and who can help you for no ulterior motive, other than that you’re part of the community,” explains Rosenberg. Rabbi Shmuli and Chayala Sasonkin, co-directors of Chabad at Rollins College in Winter Park, Fla.
For the school year ahead, Rabbi Shmuli and Chayala Sasonkin have been expanding their activities to include more programs, classes and other ways to engage students, in addition to their regular Shabbat meals and holiday events. 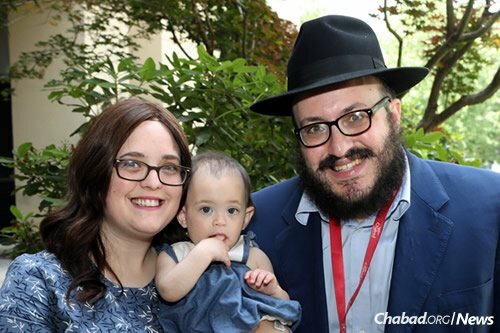 The Sasonkins arrived in Winter Park, Fla., at the end of 2016 to establish a new Chabad House for the more than 1,000 Jewish college students in this area just outside of Orlando. 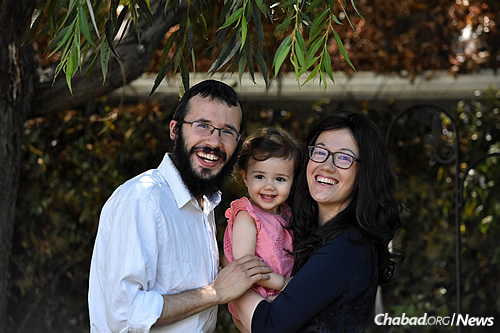 The couple, along with their two young daughters, looks forward to meeting and getting to know every Jewish student on campus. Rabbi Binyamin (aka “Rabbi B”) and Davida Murray, co-directors of Middlebury Chabad in Middlebury, Vt., arrived this August, and have since been working on meeting people and building relationships around campus. They’ve been chatting with students over coffee, and inviting students and faculty to their home for Shabbat meals. An estimated 14 percent of the school’s approximately 2,500 students are Jewish, according to the rabbi, a number that’s historically remained strong. The couple’s focus includes not only college students and the town of Middlebury, but also Jewish households in the larger Addison County. They hope to bring joyful Jewish experiences to campus, whether it’s through Torah classes, cooking for Shabbat, making challah or performing acts of kindness. “That’s what we hope to bring them—that there should be more Judaism on campus, that students should feel empowered about their Judaism,” says Murray. After a busy High Holiday season, the couple is in the process of planning Chanukah events, including a public menorah-lighting at their house. 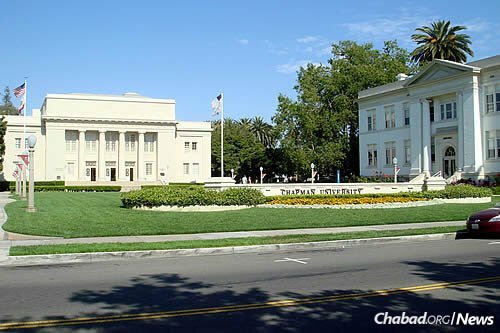 Rabbi Shaya and Brochy Bernstein headed to San Jose, Calif., last August to serve the nearly 800 Jewish students at San Jose State University, a public educational institution with more than 32,000 students overall. Based in a rented home near campus, they spent the last school year networking with students and hosting frequent Shabbat dinners. They also worked with the Jewish fraternity AEPi for a Shabbat event and a Holocaust-related movie night, and are now already planning for Chanukah parties, festivities and menorah-lightings. This year the couple is offering students more Jewish experiences, information and learning. Rabbi Avi and Tzippy Goldstein, co-directors of Chabad of the University of Rhode Island in Kingston, R.I. Rabbi Avraham Adam (“Avi”) and Tzippy Goldstein arrived at the University of Rhode Island in Kingston, R.I., last year before Sukkot. Today, they serve the estimated 1,000-plus Jewish students out of a total enrollment of about 17,000. From their rented storefront a few miles from campus in an area highly trafficked by students, they are proud to be offering students more Jewish options, says Rabbi Goldstein. In addition to weekly Shabbat dinners and holiday programming, they’ve been spending a lot of time one-on-one with students, he says. They took a group to the campus Shabbaton in New York, which draws students worldwide, and are also starting a group that volunteers with children with special needs. And this school year, they say they’re looking forward to doing even more. 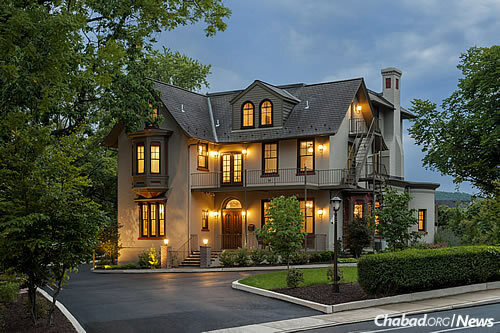 The new Chabad building at Lehigh University in Bethlehem, Pa. The center has been directed by Rabbi Zalman and Dit Greenberg for 10 years, but the presence of the state-of-the-art, 11,000-square-foot facility has drawn an increasing number of students, faculty members and even passers-by to enter its doors and join its programs. While Rabbi Zalman and Dit Greenberg have served as co-directors of the Rohr Chabad at Lehigh University in Bethlehem, Pa., for nearly a decade, they are now busy welcoming students to a new 11,000-square-foot center. They dedicated the space last October: the Joachim Schaufeld Center for Jewish Life. The couple moved from the small townhouse, where they previously held events, into the expansive new facility with state-of-the-art amenities. Now, says the rabbi, they can host up to 150 comfortably in the synagogue, student lounge and guest suites for visiting alumni. “And we have a proper shul with an aron kodesh,” says the rabbi. Of the school’s 5,000 students, Greenberg says about 1,000 are Jewish, and that Jewish life on campus is booming. The rabbi notes higher rates of participation in events, services and classes, including the amount of food he needs to serve attendees at the weekly lunch-and-learns hosted by Chabad. 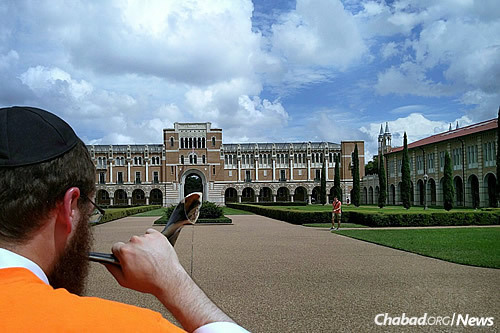 To find a Chabad on Campus center, click here. 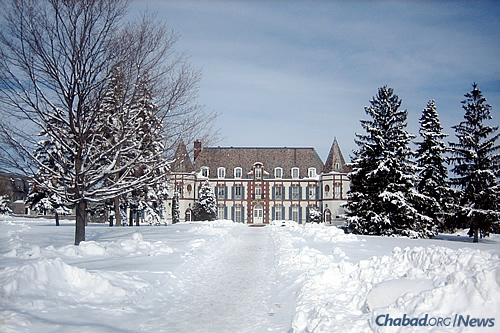 To learn more about the annual Chabad on Campus International Shabbaton, click here.